From the New Hampshire South Coast to the distant White Mountains, hotels, motels, inns, and resorts are ready to welcome the family dog on vacation – he or she is part of the family, right?. 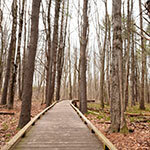 Several lodgings offer pet-friendly hospitality, even including services like dog beds, on-staff dog walkers, dog treats, and convenient maps of local walking trails. Bring your dog along for vacation fun . Call ahead to these NH dog friendly hotels, because some lodgings request a refundable cleaning deposit and place limits on the size of visiting pets. We're all animal lovers here, and we're delighted to welcome you and your pets to our pet friendly NH inn. 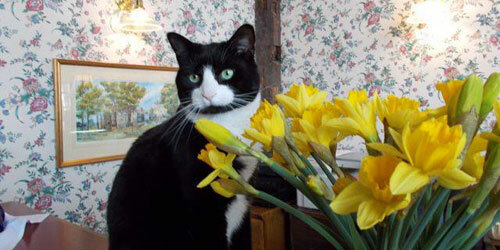 We reserve the rooms that are outside the main inn for pet owners and their furry friends on their New England vacation, for easy access to our back yard. We just ask that you crate your dogs if you leave the room, and that you pick up after them while on our grounds. We do require that you leash your dog while on the inn property. And, of course, in the unlikely event that your pet damages any part of the room, you are responsible for the damages. If you are traveling with your pet, take advantage of our Pet Package Special - you AND your pet will love it! Looking for a pet-friendly getaway that your pooch will enjoy as much as you? 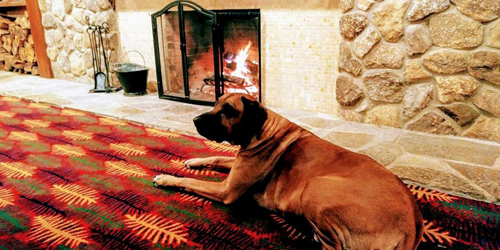 Pet-friendly rooms with all the comforts are available at the Eagle Mountain House and Golf Club. Inside the room, there is one feature pets that you and your dog will both fall in love with: windows that actually open, letting in those wonderful mountain breezes. But you need to get out and enjoy that air! 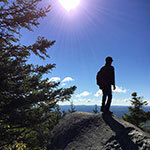 Luckily, Jackson and the surrounding area have plenty to offer in that regard, including trails in parts of the nearly 800,000-acre White Mountain National Forest. Imagine you and your dog strolling through foothills, up slopes – even over a covered wooden bridge, then heading back to your comfortable, spacious room. What dog doesn’t love a run on the shore and a splash in the ocean!? 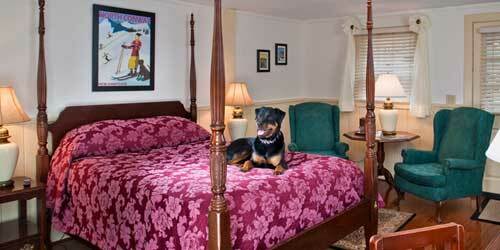 Ashworth By The Sea welcomes your dog up to 20lbs for an additional fee of $20 per night. You and your favorite pet get to hang out together along New Hampshire’s popular seacoast to enjoy all it has to offer – from the sandy beaches to long walks to simply relaxing everywhere you are. Stay in oceanfront and ocean view rooms with classic New England charm & modern touches including a flat screen TV & complimentary wi-fi. There’s also a fitness room, a 24-hour market, an indoor heated pool with retractable roof, a sun deck overlooking the Atlantic Ocean, three restaurants, and the Sandbar Rooftop Outdoor Bar. 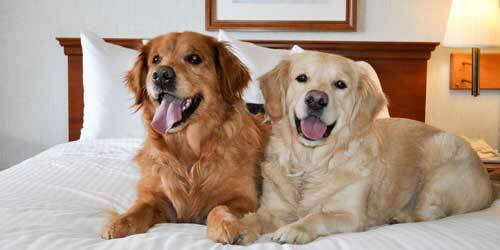 Pet friendly rooms are available mid-October thru mid-May. A personal note from the general manager with information on hotel pet services, local dog-walking routes etc. greets you. Our pet friendly rooms, located in the Mountain View Wing, offer access into the rooms from the ground level with amenities and services especially for travelers and their pets. 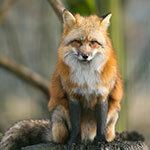 Here at The Manor we do not only welcome your pets, we love them! We offer special treats for you and your pet, including our signature pet bowls to use during your stay. A per night fee of $25 will be assessed to guests traveling with pets. The fee covers the expenses associated with the extra special attention we pay to cleaning and maintaining your room so that it stays fresh for both pets and owners. Imagine your favorite friend is with you to enjoy the scenic views and wide open spaces at the NASWA resort on Lake Winnipesaukee. 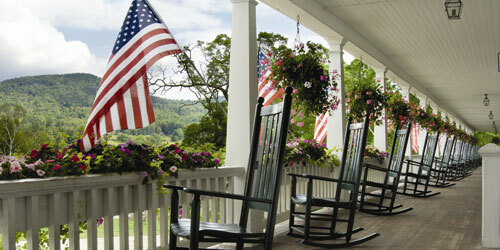 There are pet friendly rooms located in the Inn Building, a Studio Suite, a One Room Cottage, and a Two Bedroom Cottage. Upon arrival and receiving your pet deposit, you’ll receive a “Welcome Kit” with a listing of pet services in the area, treats and a pet toy. 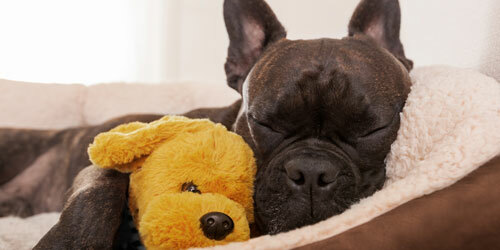 Your pet friendly room will be outfitted with dog bedding, pet bowls and pet waste bags. 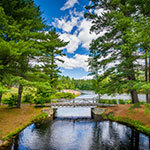 Come for fun family activities and explore this scenic New Hampshire paradise together. For those who believe a vacation is just not a vacation without the family pet, the Wolfeboro Inn has a solution: Bring your four-footed friend along with you to this stylish, historic resort in the heart of New Hampshire’s lakes region. Among its 44 cozy guest rooms and spacious suites are plenty that are pet-friendly, and your furry pal gets to choose a Frisbee or a tennis ball as a welcome gift upon arrival. The inn, with lovely Lake Winnipesaukee in its back yard and within walking distance of charming downtown Wolfeboro as well as a variety of walking trails, has a pet-friendly special in the winter and spring months, so book your room now! Families and pets go together with wide open spaces and year round recreation. 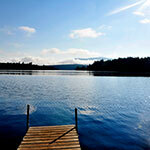 You can have it all in studio, one, two and three bedroom condominiums in the majestic White Mountains. 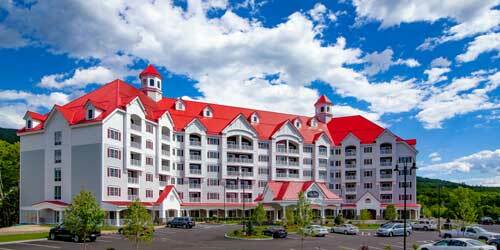 Enjoy the comforts of home and the services and amenities of a scenic mountain resort. Situated across from Loon Mountain's South Peak with great skiing and in downtown Lincoln within walking distance to food, shopping, and entertainment. The kids will love the game room, the indoor/outdoor heated pool, skating rink, skiing and the highest concentration of natural and man-made attractions in the White Mountains, where you can take your favorite friend to get outside and run. In addition, the resort also features an on-site spa, Italian restaurant and winery.